Diario takes the popular market bag and translates it into a contemporary everyday bag that can be used for shopping, carrying personal objects or whatever it fits within. Going to a Mexican market to buy “el mandado”, means shopping the food and products for preparing the home meal. In recent years, we use a bag made of a super resistant plastic textile that can be found in a large variety of colours. Therefore, the market suppliers, such as butchers, poulterers and greengrocers, noticed that this simple bag was very popular among their consumers because of its practical design and they started to give it as a branded present to their loyal consumers at the end of the year. 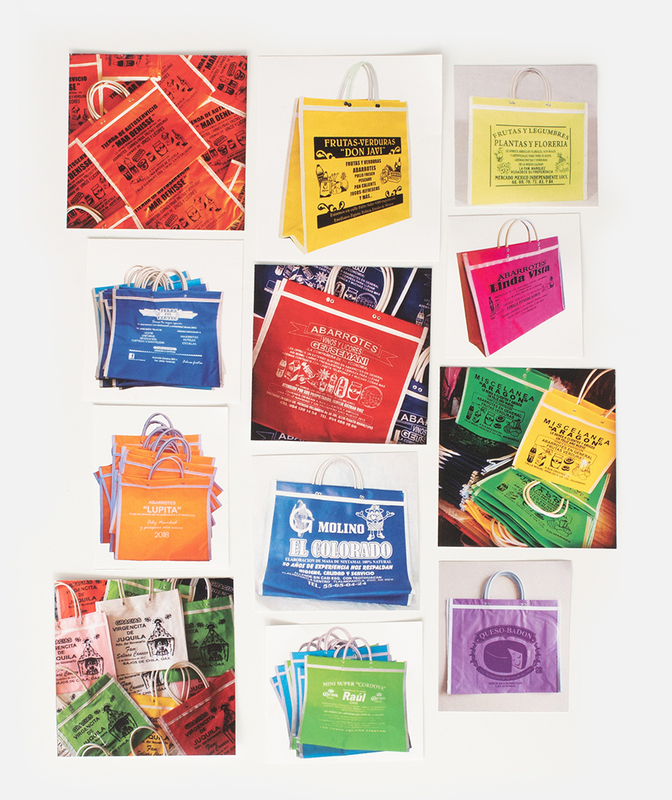 With white screen printing they place their advertising with unique and exciting designs on the frontal face of the bags. La Merced is a neighbourhood in Mexico City that has been traditionally associated with retail and wholesale commerce, especially traditional Mexican objects and foodstuff. In this chaotic and surreal place, we met Paco, who has been a producer of the traditional market bag for several years and sells it in a small establishment at Roldán Street. Recently, he produces several different models of the bag, with a variety of forms, colours and printings in his workshop located in Xochimilco, in the south of the city. He has a huge team of seamstress and people who assemble the bags. After a delightful chat with Paco, we decided that we would love to work with him in this new and exciting project, Diario’s everyday bag. We decided to create two different models. The first is a black one where all details are shades of the same colour, highlighting the different materials and textures. The second model is a colourful bag where all components are different, the materials, textures and colours contrast, creating a unique and joyful bag.